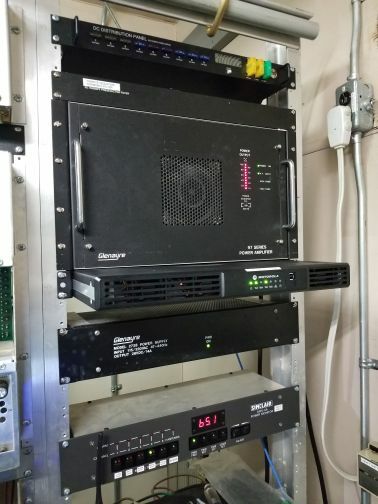 "RPT-2m" is BCFMCA's primary repeater. It serves as the hub of all activity because of its controller, which offers a variety of features to the users. With a ERP of about 400W at full power, this machine can really belt out a good signal. Coverage extends from the east side of Vancouver Island to Hope, and as far south as various parts of northwest Washington (depending on mountains). We've been told you can hit the repeater from the top of the Space Needle in Seattle, WA with a HT on a good day! Because of its wide footprint, this machine is generally used as a calling repeater, as well as for short QSO's. In the event of an emergency, this is one of the primary co-ordination frequencies used in the Lower Mainland. RPT-2m proudly runs an (nearly) all Motorola RF deck. The power amplifier is a Glenayre "paging" amplifier, rated for 100W continuous duty, and has been modified for two switchable power levels. The power amplifier is protected from high VSWR by a Sinclair Labs ferrite isolator installed on its output. The controller, manufactured by Link Communications, is an RLC-3 with DVR-1 and Input/Output options. *The machine is normally configured for carrier access (no tone required). However, it does transmit a PL tone of 136.5Hz on its output. This allows users to set their radios for PL decode to reduce intermod problems (in their radio). This machine is has an autopatch, digital voice recorder, AC/Fuse/Circuit Breaker fail detect, and is battery backed.